We have a new look and updated web site. 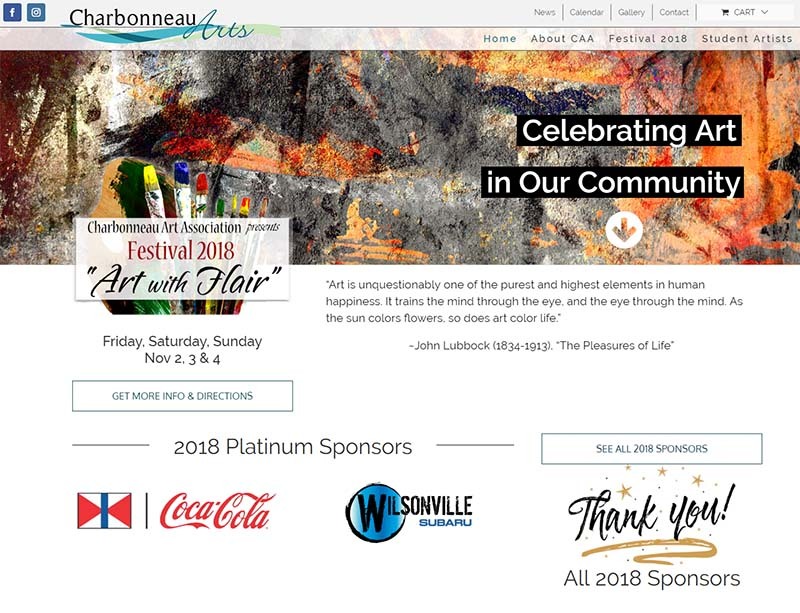 Thanks to a grant from the City of Wilsonville, our web site offers more details about us, our festival, and our work supporting public school art education, Please look around the site. I hope you enjoy what you see. We will appreciate any comments and suggestions. Our new site arrives just in time for you to order tickets for this year;s opening night Champagne Reception & Silent Auction. This gala event will be held Friday, November 2, starting at 6:00 p.m. Along with our main art gallery of local artists, a student gallery showing the work of students from Canby and Wilsonville high schools will be open. There will be champagne and catered hors d’oeuvers. as well as live music. Best of all there will be a silent auction and all the proceeds go to supporting student art education. Tickets are $15 at the door, but $10 if you buy them in advance. I hope that you enjoy our new site.